Attendees were treated to a performance, instead of a run-of-the-mill book tour. Most book tours, even children’s book tours, follow a similar script: the author gives a reading, does a Q&A, and then signs the book. But for the Diary of a Wimpy Kid: The Meltdown book tour, publisher Abrams Books and author Jeff Kinney decided to break the mold by making the tour into a performance called The Meltdown Show. Brainstorming for the tour began months prior to its October 30, 2018, kickoff. "We wanted to do something really different and make the events more of a show than a typical book talk and signing," Kinney said. By that spring, Abrams began planning in earnest. Switch was brought on to help with logistics and tour management in August. "Jeff [Kinney] was very involved in all of those conversations," said Melanie Chang, VP of children’s marketing and publicity at Abrams. "He wanted to make it an experience for his fans." In the end, the campaign team decided to create a tour that centered on a "wheel of fortune." Depending on where the spinner landed, Kinney would perform one of 10 unique skits, which would keep the performances fresh. 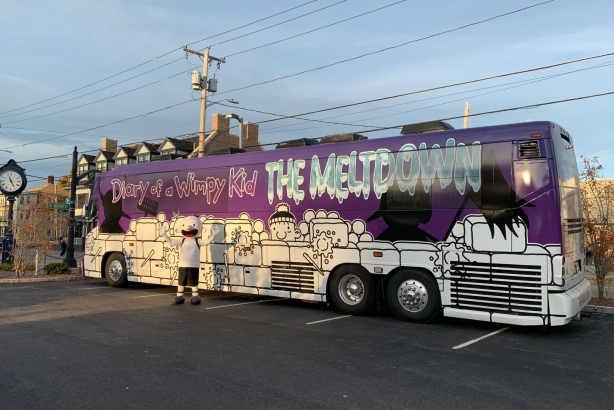 Abrams and Kinney designed a tour bus that featured art from Diary of a Wimpy Kid: The Meltdown. The show itself was a ticketed event. The eight-city East Coast show featured a one-hour interactive performance, which varied from city to city, featuring trivia contests, dance-offs, and snowball fights, among other activities. "It was hugely interactive," Chang said, which allowed kids to become "part of the fun and part of the story." To promote the tour, Abrams worked with local book partners, relying on their social networks and other promotional channels to generate buzz among shoppers and fans of the Diary of a Wimpy Kid series. Abrams also advertised the tour via local television commercials and paid social media posts. About a week before each scheduled show date, the publisher reached out to local media outlets, inviting reporters to attend the performance and interview Kinney. Abrams sold more than 7,000 tickets to The Meltdown Show. The tour was covered in by numerous local outlets and national outlets such as The Washington Post and Publishers Weekly. Diary of a Wimpy Kid: The Meltdown has sold more than 2 million copies worldwide, reaching the top of The New York Times, Wall Street Journal, and USA Today’s bestsellers lists. The tour bus served as a moving billboard and many kids attending the events took pictures in front of it, said Chang.